Sensex at 20,500 or 14,500 in next 6-9 months —- Time to be Cautiously Optimistic. The last time we gave a detailed presentation on our website was on May 21 2010. 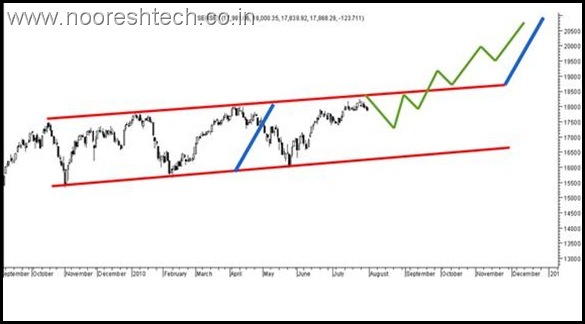 In our ARTICLE we had shown a chart with a view that Index would turnaround from 16000-16400.The title of the article was – Time to be Optimistic not scared. We were the only few who were bullish for 18k to be crossed in JulyJ and the low made was 15960 very close to our view !!! And now we are at 18000-18500. 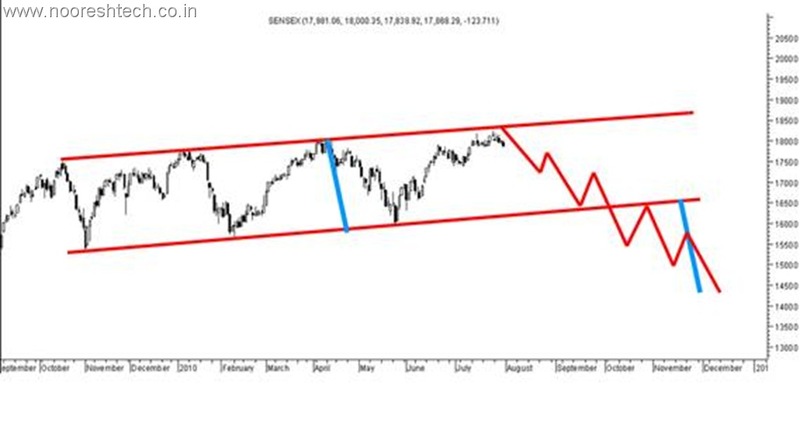 Recently in our free seminar in Mumbai we had mentioned about a huge resistance around 18400-18600 and we are continuously seeing a dip coming from that zone. 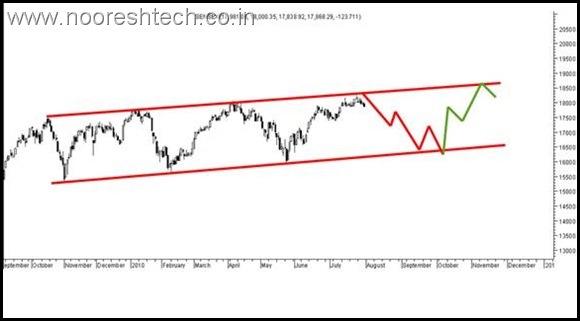 Also we had discussed the possibilities for the Sensex in next 2-3 quarters. 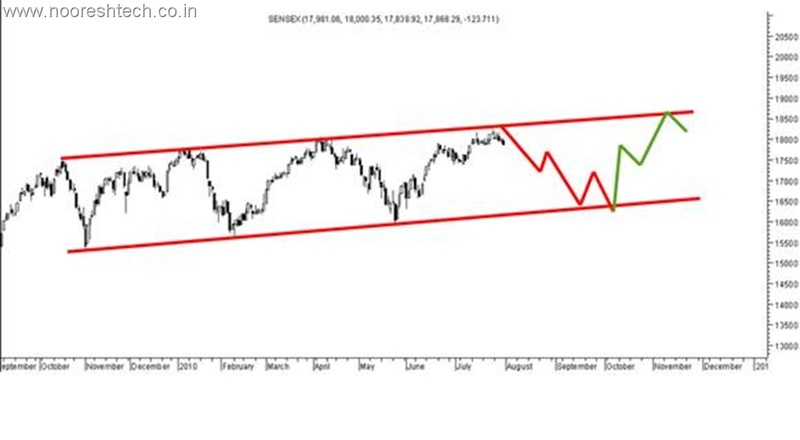 After almost a year of range bound move we expect the markets will see a major directional move which should ideally take the markets towards 20500 or 14500. So investors need to be ready to face the big move possibility. Below,I would discuss the all three possibilities and the one which we favor. Sensex dips to 17800-17200 zone and turns around totally to head towards 18600/20500 over the next 2-3 quarters. Strategy: As being mentioned to keep increasing cash at 18400 and avoiding leverage should now look to deploy the same at 17200-17800 range slowly with a stoploss of 16900 on closing basis. Sensex dips to 17100-17400 and bounces back sharply by a few hundred points and then starts the major decline towards 16500/14500. Strategy: Sell only when after the bounce back of a few hundred points or on break of 16900. 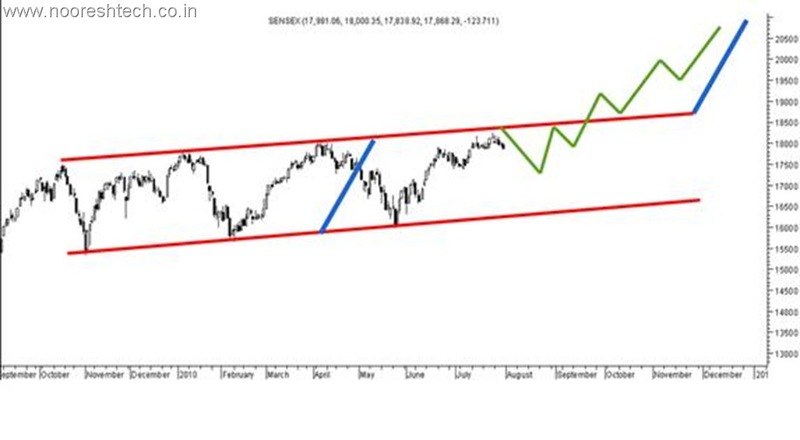 Sensex maintains the range of last 1 year and dips to 16300-16500 over the next 1-2 months and then back to 18900. We will review the above scenarios in our weekly posts as and when we reach 17800/17200. What is ur view on gold now? is it a good idea to move our fund from stocks to gold till the sensex shows a clear direction ? Gold as an asset should only be used as a hedge to inflation or diversification. Dont try to shuffle between equities and Gold. 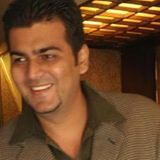 sir, will there be your analysis training programme at bangalore? if so will it be on saturday/sunday. and i not knowing anything about tech analysis, but do know a little bit of how to check company fundamentals, be able to understand what you teach. This maybe an utterly stupid query. 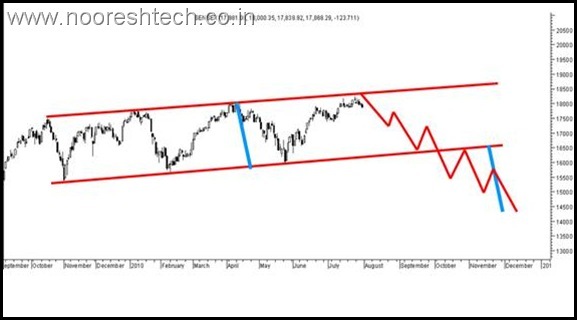 In all your three possibilities, Sensex will dip for sure ( 1st 17800-17200 2nd 17100-17400 3rd 16300-16500. So why not sell our entire portfolio and re-enter at lower levels. Risk-Reward ratio favours selling off the portfolio is what I feel. Opportunities will always be there in the future. Atleast capital erosion is prevented. The major issue is stocks may not entirely follow the index as i have shown in an example about Small Cap and Mid Cap Index. Stock Specific opportunities will still be available in the dip and as i said i am in favor of 1st case which is 5% dip on Index. Thats not a big deal as the upside could be 20%. What is the short term outlook for Banking stocks especially heavyweights like SBI. ICICI, HDFC etc.